Viet Cong started digging the network in late 1940s. With this network, soldiers were able to communicate, supply, and store weapons. In the network existed living quarters, offices, kitchens, and hospitals, and even with music halls in some areas. During the war, Viet Cong soldiers often set traps for South Vietnamese and U.S. soldiers, which included either grenades or poisonous insects. During this time, Viet Cong soldiers would often stayed underground during the day to either work/dig or rest, and came out at nights to look for supplies or combat in battles. As you can imagine, the life underground was hard. There was a constant threat of diseases like malaria and cutaneous conditions, infested with ants, poisonous insects, and vermin. From 1966 to 1968, there were several attempts from the U.S. troops to attack and sweep the tunnels. 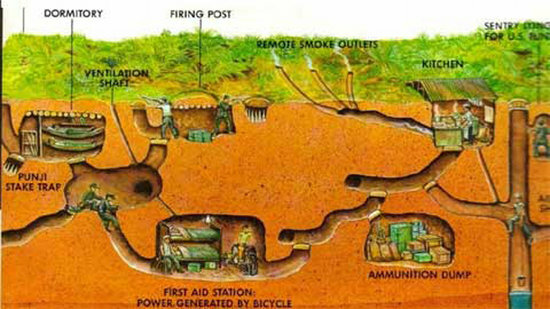 About 45,000 Vietnamese died in defense of the tunnels. There are two display sites of this historic place: Ben Dinh and Ben Duoc. When coming to the display sites, visitors will get to watch a wartime documentary film showing how the tunnels were constructed and how the system worked. 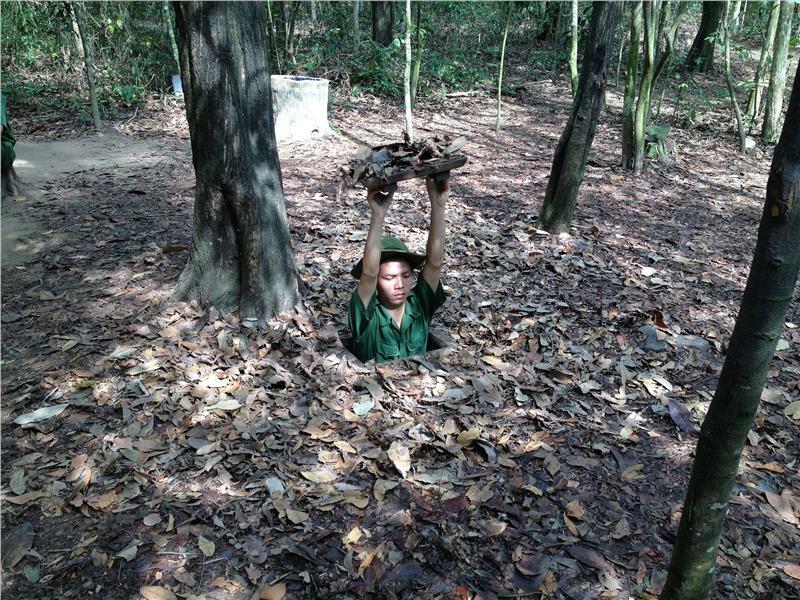 After that is the exploration of the underground maze, including restored booby traps, conference rooms, kitchens, underdeveloped parts of the Cu Chi system, and even sampling the meals for soldiers during wartime. Keep in mind that the parts allowed for visitors have been made very safe with cement coated walls, and therefore what you feel and experience is only a part of what Viet Cong soldiers went through. The entrance fee ranges from 90,000 dong to 110,000 dong (4 to 5 US dollars) depends on which tunnel site you go to (Ben Duoc site is a little further away from Ho Chi Minh City, while Ben Dinh is closer but more crowded). If you to the Ben Dinh site of Cu Chi Tunnels, there is a shooting range where you can try to fire rifles at the cost of 35,000 dong a bullet. Ben Duoc does not have a similar shooting range; however, it features the Monument Temple for Martyrs and remembrance garden built on the land once destroyed by heavy bombing from the war. It does not take much time to visit the Cu Chi Tunnels (usually half a day excluding travelling time); however, it is worth every moment to visit this wartime iconic symbol. You can have the opportunity to experience what lengths Vietnamese people went through during the French and the U.S. wars. Bring long pants and wear a good pair of shoes because you are going to do a little bit of climbing and crawling, and stay hydrated!